Healthcare experts have undergone training on systematic reviews to better inform policy and practice. 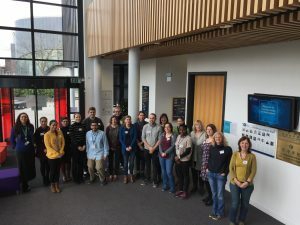 The University of Nottingham led a Joanna Briggs Institute (JBI) accredited Systematic Review course for 23 researchers, academics, clinicians and students. The five-day course aimed to give the participants an in-depth and comprehensive understanding of the principles and processes of undertaking systematic reviews to inform healthcare policy and practice. This course was delivered by a team from the University of Nottingham Centre for Evidence Based Healthcare (CEBHC), with support from Continued Professional Development Services. The CEBHC is a designated Centre of Excellence within the JBI network, a global collaboration that promotes evidence based healthcare and that has pioneered methodologies for evidence synthesis. As well as a formal certificate, participants will also receive one year’s free access to the JBI’s systematic review software programme, SUMARI.